I have terrible dry skin, almost eczema that I have to slough off everyday. When I take this, the dry skin goes away and my skin becomes very soft. When I stop taking it the dry skin returns. I don’t know what it would do for those with oily skin, but if you have severely dry skin, this helps alot. 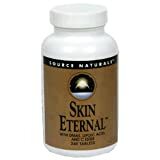 After watching a PBS special with a famous dermatologist, who’s name escapes at the moment, I was convinced of the benefits of specific ingredients, including alpha lipoic acid and c-esters (not ester-C) for their anti-aging properties and overall health benefits. His products were very expensive. I discovered this product and it has nearly the same formula. I have noticed a definite difference in my skin tone, energy levels, and a reversal of other “age related” problems. There is NO HGH, only beneficial antioxidants, anti-inflammatories, and other helpful ingredients.